May the heart of Jesus, in the Most Blessed Sacrament, be praised, adored, and loved with grateful affection, at every moment, in all the tabernacles of the world, even to the end of time. Amen. he Pauline Fathers and Brothers together with the Shrine’s Eucharistic Adoration Group would like to invite you to spend a little time with Jesus in the Most Blessed Sacrament here at the Shrine of Our Lady of Czestochowa. 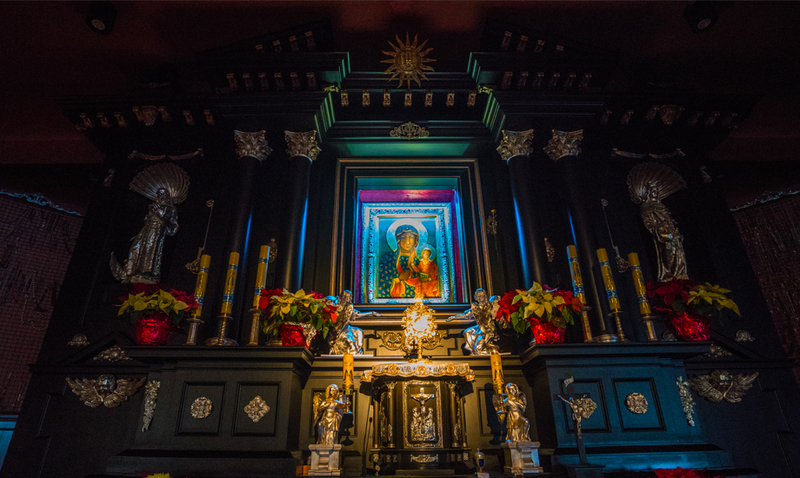 The Exposition of the Most Blessed Sacrament takes place daily from Monday thru Saturday from 12:00 pm (noon) to 5:00 pm at Our Lady of Czestochowa Chapel (lower Chapel). Today, many parishes and shrines throughout our nation and around the world have perpetual adoration of the Most Blessed Sacrament. The Holy Spirit is enkindling in the hearts of the faithful, the fire of His love, thus renewing the Life of the Church. This is truly the New Pentecost, the New Springtime of Evangelization which Pope John Paul II has often called upon. God is certainly showering His graces upon our Shrine. You will obtain countless graces for so many who are far away from God. In one of St. Faustina’s writings, Jesus appeared to her and explained that each person coming before Him in the Most Blessed Sacrament represented all humanity and that every man, woman and child on the face of the earth can experience a new effect of His goodness, graces, love and mercy for each Holy Hour made in His presence. Please show your support for this beautiful devotion to Our Lord Jesus Christ, present Body, Soul and Divinity in The Most Blessed Sacrament, by signing up today. Let us unite with our brothers and sisters throughout the world in prayer and adoration before our God, so that through His Grace and Providence we can fight against the forces of the culture of death. Please fill out one of the forms provided at the rear of the Lower Chapel and send it to the visitor center main office.